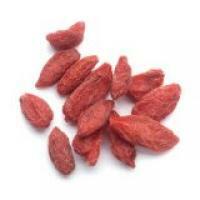 The amount of vitamin C in goji berries actually varies widely. The amount of any vitamin in a food source depends upon where the food comes from, how it was grown, and how it was processed. Goji berries are no exception. Hailing from China and Asian countries, the goji berry or wolfberry is a red bottle-shaped berry that grows on shrubs. While it can be eaten raw, it's mostly used as a dried fruit similar to raisins that's incorporated back into cooked dishes. It's also juiced, and goji berry juice is quite popular. Goji berries have been cited as a so-called 'superfood', but like the acai berry, their marketing may be more hype than fact. While they do indeed contain an abundance of healthy vitamins, minerals and antioxidants, they don't have any special properties or healing powers. When eaten along with a balanced, healthy and varied diet, they can add good boosts of certain vitamins to the diet, but should not be relied upon as a panacea. The amount of vitamin C in goji berries can vary. According to published reports, it may be as little as 29 mg per 100 grams of berries to 148 mg per 100 grams of berries. This range is either 32 oercent of the RDA on the low end of the scale to well over 100 percent of the RDA on the high end of the scale. There's no way to tell if the package of dried goji berries you bought today has an abundance of vitamin C or a dearth of it. That's why it's important to eat a wide variety of foods to get plenty of vitamin C in the diet. In addition to vitamin C, goji berries contain plenty of minerals. They're a fairly good source of potassium, calcium, iron and zinc. They also contain vitamin B2 (riboflavin) and come close to providing 100 percent of this important B vitamin. 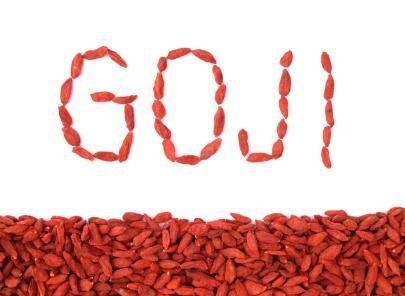 Goji berries contain an abundance of antioxidants. Antioxidants neutralize or mop up free radicals. Free radicals are unpaired electrons that can bounce around and damage cell DNA. Like other red-orange fruits and vegetables, gogi berries contain beta carotene and a total of five known carotenoids: zeaxanthin, lutein, lycopene, and others. If you can eat an orange and a grapefruit and still get enough vitamin C, why buy an expensive, imported berry or juice? There are many reasons to include these berries in the diet. Some early research indicates that goji berries may have anti-inflammatory properties. Additional potential benefits include improved cardiovascular health. Surprisingly, goji may interact with some medications. Adverse reactions have been reported by people taking the drug wafarin and drinking goji berry tea. Two women who were on this drug and drank large quantities of goji berry tea experienced excessive bleeding. Goji berries also contain trace amounts of atropine. While the amount in normal quantities of berries used in cooking and snacking is low enough not to cause problems, people eating large quantities of goji fruit or drinking a lot of goji tea or juice may exceed the safety limits of atropine. As with anything, moderation is key. Dried goji berries may be obtained at health food stores and supermarkets nationwide. Goji juice may also be found where health beverages are sold. Use small quantities of goji in recipes to add interesting flavor to foods.Whether you take this food for its vitamin content or just to enjoy an unusual taste, the amount of C in goji berries rivals other fruits and vegetables. It can become part of a healthy diet and provide plenty of vitamin C.